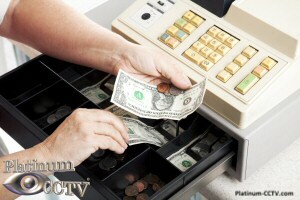 Businesses of all types are vulnerable to theft, vandalism or worse. These types of events can erode away at profit margins and make it difficult for businesses to succeed. One of the best ways to protect your business from theft, vandalism is to install a quality business security camera system. Security cameras can easily install in any business and are widely recognized by ne'er do wells and scofflaws, to help deter individuals from trying to take advantage of your hard earned and hard fought business. If someone decides that they are going to steal anyway, a camera system will help provide you with evidence, so that you can see exactly what happened and dispense justice accordingly. Security cameras can be installed inside and outside, delivering various benefits with a wide range of quality and features to suit virtually any business budget. Indoor security cameras are found in hidden style and dome styles to suit the decor and function intended. If you are looking to covertly record video so that your employees or customers don't know that they are being watched, then hidden style cameras are a great selection. These hidden style cameras come in many different forms, ranging from motion detectors to smoke detectors or even a common alarm clock or necktie. Hidden cameras can be concealed almost anywhere, and deliver great quality video so that you can finally get evidence of who is stealing money from the till. Dome style cameras are popular as a deterrent, because they are clearly visible so the individuals who are looking to see if they are being watched will clearly be able to see that you have cameras, while other customers will not have a huge camera staring them in the face. The Dome style cameras are the most popular for all types of businesses, ranging from restaurants, bars, office buildings, retail stores and more. Outdoor cameras are also available in several different styles, ranging from bullet style cameras and armor dome cameras to more expensive PTZ style cameras which have motors allowing control of the camera. Bullet style cameras consist of an image sensor built into a cylinder that normally has a bracket that can be either wall or ceiling mounted. Bullet style business security cameras mount on a wall or ceiling and stick out from the building, making them very visible to help deter miscreants from causing damage to your building or business. Armor dome style cameras are popular because they can be either ceiling or wall mounted and are more vandal resistant. These cameras are less obtuse, for business owners who don't want it to be quite so obvious that you are watching what is happening. Business Security camera systems come in many different varieties, including Standalone DVRs, PC Based DVRs and High Definition MegaPixel IP Camera Systems. Standalone DVRs are the most basic style of camera system, including traditional CCTV security cameras and a standalone DVR recorder. This DVR recorder will record from the cameras, and provide live remote viewing from a PC, Laptop, iPhone, Android or BlackBerry PDA phone. These systems are great for lower budget security camera installations. 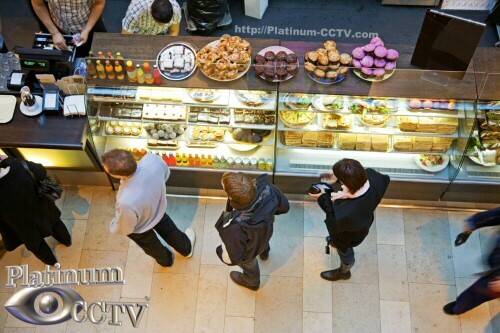 PC-Based Alnet® Security Camera Systems are an upgraded type of restaurant camera system that uses a computer in the business to record from the cameras. This type of system has improved playback features, making it easier to find important video and play it back/back it up quickly. The Alnet® PC Based DVR systems also provide added benefits for remote viewing from iPhone, Android and BlackBerry phones, allowing for a Multi-Camera live view as well as playback capabilities, giving you the ability to view your security cameras and even playback from anywhere. The newest and most popular style of business security cameras are Platinum CCTV MegaPixel High Definition IP Security Cameras, these high definition cameras have higher resolution image sensors, providing much higher quality video than any traditional CCTV security cameras (7-25 times the resolution). These cameras come in indoor or outdoor varieties, and allow business owners to record at HDTV resolutions onto a PC with NVR software, so that you can even zoom in on live or playback footage to get the full quality. These new business IP camera systems allow you to use less cameras and cover in greater detail to avoid from having the annoying grainy video that you see all-to-often on the news. Regardless of the types of business security cameras or systems you choose, make sure that you protect your investment with security cameras.